Thank you for the services at your establishment on February 13th, 2016. I loved the space and setting. It was perfect for my intimate party. My guests was very surprised at the modern intimate setting. I will recommend Arabella’s Castle to my friends and family. ~ Mary Lou. Thank you for making the last minute exception for us when we need a space to host my mother’s memorial service. It was very much appreciated. Valerie and Joey are of excellence at its best. They provided me with a great venue and a wonderful price to match!!. My baby shower was so beautiful and everyone loved the venue. I would recommend them to everyone. They are great people and will make sure your event is one to remember like they did for me!! Thank you. I had my baby shower at Arabella’s Castle and the celebration was beautiful. The service was outstanding. From the first visit to the day of my event everything was smooth and stress free. The staff was so accommodating and wonderful. My guests was very impressed with the venue and service, they’re still talking about my party. Joey was very easy to work with and he tries to make everything perfect. Thank you all for a wonderful and memorable day. Thank you for making our engagement party a cherished moment. 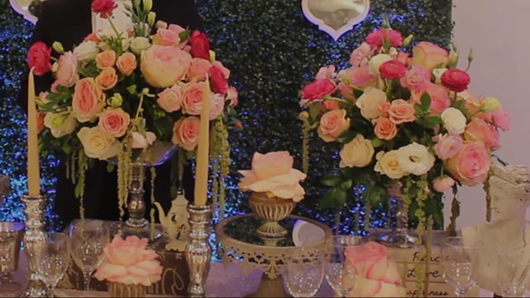 The services that your venue provided was beyond our expectations. From the centerpieces to the cake, everything was just perfect. I will highly recommend your venue. I wish you nothing but success. Thank you. Previous Previous post: Welcome to Arabella’s Castle.